I am a fan of ruching. I love when the strings are pulled taut for an adorable or fashionable addition to a shirt, hemline, skirt or back of a bikini. I think it adds an element of sweetness and style to anything. I love that this is a trend in workout gear. I am not a big fan, however, of the loop that is left of the bottom of the ruche. I get it, I just think we need to finish the intended look. 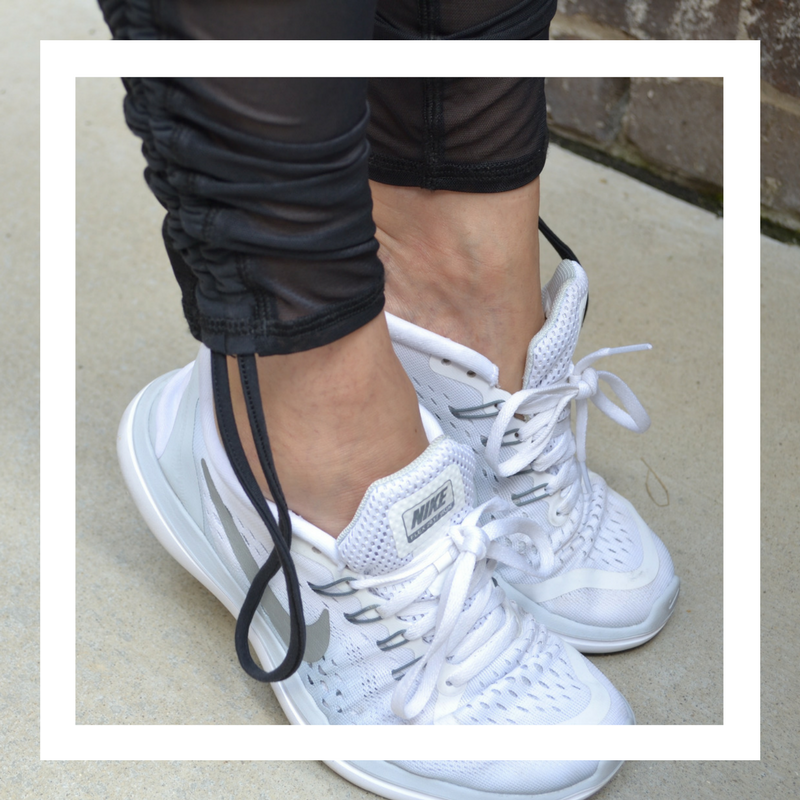 I have a couple of workout tops as well as a new pair of workout pants that have these loops. You have them, too? Yeah, did I mention I’m not a fan? It could be dangerous on the bottom of pants, too. I guess I could tuck them in, but they would eventually just fall out our hang halfway down and look like an accident. No good. I mean, I would be the girl in the gym with my foot caught in the fabric loop on the treadmill being treated by a paramedic because of her pants! OR, what if the loop got caught under the belt of the treadmill and my pants just flew right off?!? That would be tragic for all involved! So, I have come up with a simple and adorable way to deal with this. CUT, KNOT and TIE IN A BOW. I have these pants. They are the Calia brand by Carrie Underwood. I do think her athletic line is darling and who doesn’t want to support an amazing, beautiful soul like her? I love the mesh inserts placed at the bottom 1/3 of the pant to add some interest to them. The mesh is a big trend and I love it! I love the ruching, too. Let’s finish it, shall we? 1. Pull the loop down and push the fabric until you have the desired gathered look. Some people like a lot of gather and some people like just a little. 2. Pull the loop gently to straighten it out. Cut the loop in the center. You will now have 2 strings hanging down. 3. Tie a small knot at the end of each string. Try to get it as close to the end as possible. Trim the end if needed. 4. Tie the two strings into a bow. SO CUTE! If you tie it and you find that the bow is just too big for your taste, simply cut the two strings shorter and repeat steps 3 and 4. You could also simply knot the two strings at the end of the rushing, not even make a bow, and just have a couple of cute knotted ties hanging down. Your call! Just make sure that you don’t cut the strings too short! I love THIS look. I find this a lot more pleasing to the eye and a lot more safe, lol! Have fun styling your ruching!! Next Post Thoughtfully Lovely? What’s behind the name?